The NETGEAR CM1000 Ultra-High Speed Cable Modem provides a connection to high-speed cable Internet with speeds up to 1 Gbps†. 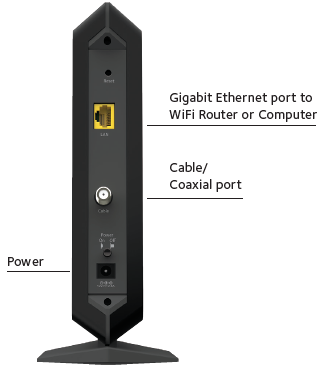 It is the industry’s first DOCSIS® 3.1 CableLabs Certified® cable modem, 10X faster than DOCSIS 3.0††. Working with DOCSIS® 3.0 and DOCSIS® 3.1 cable Internet service providers, it is the ultra-high speed cable modem ready for today’s service plans and future upgrades. Enjoy ultra HD video streaming over IP with 2x2 OFDM or 32x8 channel bonding giving you the fastest download speeds—even during peak hours. Save up to $120 a year* by eliminating Internet service provider rental fees. Ideal for fastest Internet cable services like Comcast XFINITY® Gigabit, Extreme and Performance data plans. * Based on a typical monthly equipment rental fee of $10 per month.